British Prime Minister David Cameron said on Sunday that there was a “very big difference” between the Russian and British views of where to lay blame for the deteriorating Syrian crisis, but added that both countries shared a common aim to end the conflict. Cameron made the remarks after meeting Russian President Vladimir Putin at Downing Street in London ahead of the G8 summit in Lough Erne, Northern Ireland. Cameron said that despite their differences the two leaders both wanted to keep Syria intact and get a transitional government in place. Putin said “blood is on the hands” of both the Syrian government and the rebels. He said the behavior of some rebels who “eat the organs” of their enemies went against the “humanitarian and cultural values” of Europe. Putin was making a reference to a video that emerged last month which appeared to show a Syrian rebel commander cutting out the heart and liver of a dead government soldier, and then signaling he would eat it. Both leaders agreed that the situation in Syria had become a humanitarian crisis. 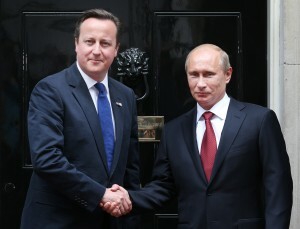 “We will use the opportunity of having G8 leaders together to try and build on this common ground,” Cameron said. The two leaders agreed that the conflict could only “be resolved by political and diplomatic means”. The G8 summit will be held on Monday and Tuesday with the participating of Canada, France, Germany, Italy, Japan, Russia, the United States and Britain. Putin is also scheduled to meet Monday with US President Barack Obama to discuss the Syrian conflict.